In the 1910 census,3 Warren discovered a tantalizing, albeit confusing clue. Confusingly, Albert’s wife was not the elusive Catherine, but an Irish woman named Mary. Less than two years after the enumeration, Warren’s grandfather was born. Could Mary be his real mother? Did she pass away soon after the enumerator’s visit? Were Catherine and Mary the same person? Was the Maine connection a North Atlantic red herring? Utilizing the clue from the census, Warren and father contacted the Dutch Island Lighthouse Society. They traveled to the island several times. “We toiled for years to try to find any record of Catherine,” Warren related. They searched for a decade with no luck. The article contained the sad story of the years between the census and the birth of Warren’s grandfather. In the spring of 1911 Albert’s father died suddenly. It was perhaps during his travels to settle his father’s affairs that he learned of Mary’s. He confronted her when he returned and she confessed. She admitted to Albert “that before she married me she lead a fast life in New York for ten years.” She left the island in shame. Albert took in his newly widowed mother and received permission to hire a housekeeper to help her. He turned to a domestic working for the fort’s doctor, Catherine Lyal of Maine. No wonder the family had been kept in the dark. After the discovery, Warren noticed that Catherine Lyal had been hiding all along on the 1910 census, just three households away from Albert. There she was, listed as a cook at the [Enders] residence and unbeknown to my father and I all these years, she had been the great-grandmother that we had struggled to find. It seems sort of eerie to look at that form and know that infidelity would soon befall the lighthouse keeper of Dutch Island light. 1. Warren Porter, [address withheld for privacy], “Anomalies & Serendipity,” e-mail to Ancestry Insider, AncestryInsider@gmail.com, 24 February 2010. 2. 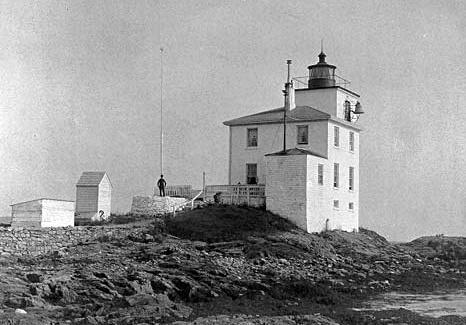 “Dutch Island Light Station,” historic photograph, undated, “Dutch Island, RI,” LighthouseFriends.com (accessed 3 July 2010); crediting U.S. Coast Guard. 3. 1910 U.S. census, Newport County, Rhode Island, population schedule, Jamestown Town, Army Post at Fort Greble, enumeration district 32, sheet 8-A, lines 30-1, Albert H Porter household, also line 21, Catherine L Lyal; digital image, Ancestry.com (accessed 3 July 2010); citing National Archives microfilm publication T624, roll 1437. 4. Wikipedia contributors, “Dutch Island (Rhode Island),” Wikipedia, The Free Encyclopedia (www.wikipedia.com : 25 March 2010 at 15:39); a search for “Fort Greble” places Fort Greble on Dutch Island. 5. Sue Maden and Rosemary Enright, “Keepers of the Dutch Island Light: The light is Re-lit,” The Jamestown (Rhode Island) Press, 29 October 2009, online edition (www.jamestownpress.com : accessed 3 July 2010).